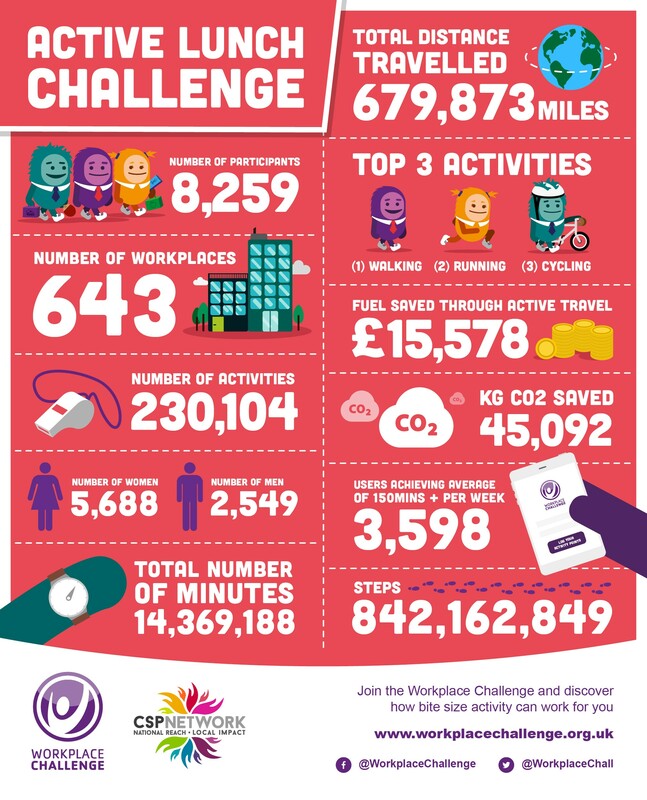 An amazing 8,259 challengers recently took part in the Workplace Challenge #ActiveLunchChallenge, together travelling more than 679,873 miles, that 27 times around the world and logged 1,436,918 ten-minute bite size chunks of activity. The Active Lunch Challenge was an 8-week national activity logging challenge that took place from the 4th January to the 28th February 2017. Workplaces and employees across the country took part in the challenge, logging their points to climb our national leaderboards, with a selection of great prizes on offer. People were encouraged to add bite size activities into their working day. Ten minute bite size activities were anything that got heart rates elevated, and made people feel a little bit warmer and got the blood pumping! From a brisk walk in a midday mile, to table tennis workplaces took up the challenge across the country. The national challenge was a great way to make an active change to peoples daily routine. Rally the troops and get workplaces moving, enjoy some friendly rivalry competing against local workplaces, and more importantly logging activities that helped make resolutions a reality! The Challenge built on the findings of the Flexible Lunch Break manifesto, which provides evidence to employers into the benefits of a healthy and active workplace. Workplace Challenge’s activity tracking platform is a free online facility available through www.workplacechallenge.org.uk that enables individuals and workplaces to log all of their physical activity, and easily compare activity levels to other participating individuals and organisations. Active loggers will be able to see a variety of stats including distance travelled, calories burned, CO2 saved and progress against the recommended 150 minutes of physical activity per week using a targets bar. It's also possible to set personal targets in 2015 (linked to fundraising if you wish) and create your ‘circles’ to compare your progress against friends and colleagues. All these features and more are available from your dashboard. A minimum of three registered employees are required for a workplace to appear in a leader board and people can also track their own individual progress locally and nationally. County Sports Partnerships across England locally manage the online platform for their community, ensuring that there are challenges, activities and competitions available offline to encourage people to stay active. Workplace Challenge is supported by Sport England through the Get Healthy Get Active fund. The CSP Network represents 44 local County Sports Partnership teams across the country. The CSP Network delivered The Community Games – one of the most successful community campaigns seen in the UK, attracting over 2 million members of the public to come together in local communities to take part in active cultural events inspired by London 2012. The BHFNC was established in April 2000 with funding from the British Heart Foundation. Based in the National Centre for Sport and Exercise Medicine at Loughborough University our aim is to create an active nation by translating research evidence into practice to improve and extend the promotion of physical activity in the UK. We do this by undertaking research and evaluation and supporting professionals across a range of sectors including health care, education, transport, sport and leisure with practical evidence-based tools to promote physical activity. For further information on our work go to www.bhfactive.org.uk.